I've always been somewhat surprised by the Corps of Engineers continued use of PVC dumbbell waterstop in their flood control and dam projects. After Hurricane Katrina hit, and large portions of floodwall needed to be repaired or replaced, the COE's design still called out for this largely out-dated style of waterstop. Dumbbell waterstop functions like a cork in a bottle, with the large end bulbs simultaneously acting as both anchors and internal dams. Historically, dumbbell waterstop is one of the leakiest varieties of waterstop, as the large end bulbs when pulled under tension distort to an elliptical shape, while the concrete cast against them remains in a round shape and therefore creates an annular void for water to migrate through. Now, large portions of the rebuilt floodwall in Kenner, LA are leaking and expensive repair procedures are taking place. I would imagine that simply by specifying a ribbed centerbulb waterstop this entire failure could have been avoided. 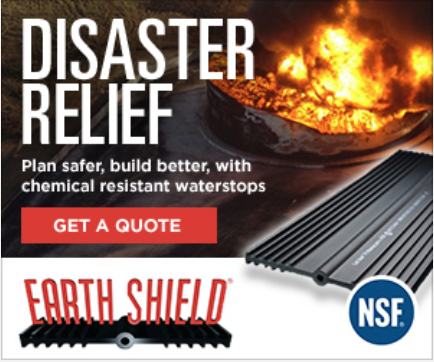 JP Specialties, Inc. has developed a new Earth Shield® waterstop product specifically designed to accommodate large shear movements, such as tank ring foundations subjected to settlement. The JP621L Retrofit Waterstop System is chemically and mechanically adhered to the existing concrete using one of our chemical resistant, novolac epoxies (VEN500 or VEN1000), stainless steel batten bar, and stainless steel anchor bolts. The waterstop profile is combed along the fastening leg, which facilitates the epoxy bonding to the profile. The embedded waterstop leg has two large polymer dams which are designed to create a torturous fluid path and simultaneously perform as anchor points for the new concrete to bond to. The JP621L profile has a large, tear-web centerbulb that can move greater than five inches without deformation of the waterstops main body. (The thin diaphragm, or "tear-web", ruptures under shear stress, allowing the "U-bulb" to move freely for its entire length when installed in an open joint.) JP621L Retrofit Waterstop can be heat welded to a continuous, fluid-tight barrier, like all our Earth Shield® waterstop profiles, and can be joined to our baseseal (or rearguard) profiles for intersecting joints. CAPwrap™ creates a fluid-tight barrier with its two embedded polymer anchor dams. The CAPwrap system functions as an internal waterstop between round pipes or columns and the concrete that is cast against them. The oil refinery in the Gulf Coast city of Port Arthur is the oldest in Texas. Soon, it will be the largest refinery in the United States. Under contract to Motiva Enterprises LLC, a joint venture of Bechtel and Jacobs Engineering Group is expanding the Port Arthur Refinery, a project that will increase its capacity from 275,000 to more than 600,000 barrels a day. Underscoring the size of the project is the amount material and equipment it will require: 260,000 cubic yards of concrete, 2.4 million feet of pipe, 5.6 million feet of cable, 54,000 tons of structural steel, and nearly 300 modules, each weighing more than 1,200 tons. The construction phase of the expansion began in the fall of 2007. Completion is scheduled for 2010. At peak construction, the project will employ between 5,000 and 6,000 workers. The Port Arthur refinery went into operation in 1903, following a gusher and oil boom in nearby Beaumont. The refinery played an important part in the production of high-octane aviation fuel in World War II. Today it is operated by Motiva, a joint venture of Saudi Refining, Inc. and Shell. 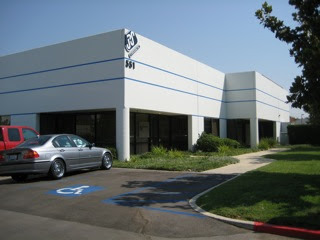 We're pleased to show off our newly remodeled and refurbished plant located in Lake Elsinore, CA. Both aesthetic (to the building) and mechanical upgrades (to the extrusion area and fabrication shop) were completed over the last several months. Major evolutions included epoxy injection repair, new roofing, HVAC upgrades, ventilation upgrades throughout factory, bathroom remodel, water-blast and paint. 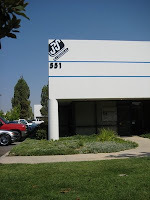 The newly freshened-up factory will serve JPS needs as we continue to grow our product lines and take on new markets. Designed for people with dial-up or slow internet connections. If this is you, pay it a visit! I was recently in a long call with an engineer client and many of the questions he was asking, were answered directly in an old document we use to publish in our catalog. I searched through the hard-drive, found the document, converted it to a PDF, and posted it here. This PDF contains some typical waterstop formula for placement and design considerations and some interesting information on leakage testing. A new Earth Shield Waterstop catalog designed especially for the needs of concrete accessories distributors was published on our website today. This catalog is a compressed version of our regular catalog and contains the information most relevant to our distribution partners and omits some of the extra data that our engineering clients require. Our new website design is now officially "live" and available for all your waterstop information needs. This is the first major redesign since 2000, and I feel it lives up to the functionality of its predecessor, while being more aesthetically pleasing. Please stop by for a visit and let me know what you think.